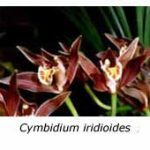 The majority of the standard (large-flowered) cymbidiums that we grow today were derived from only eight cymbidium species, most of them native to the southern or western slopes of the Himalayas. 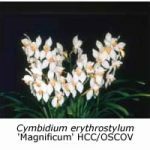 Some of these species were and still are rare in Nature and uncommon in cultivation but others, especially Cymbidium lowianum, are quite widespread in Victoria today. The eight species are described in the order in which they were first introduced to cultivation in Britain. 1. Cymbidium iridioides (then known as Cymbidium giganteum ) was first collected in Nepal in 1821 but was not introduced into cultivation until 1837, when John Gibson collected it in the Khasia Hills (northern India) for his employer, the sixth Duke of Devonshire. The fragrant flowers (75-100 mm across) have brown-and-yellow-striped petals that do not reflex and a white, non-hirsute labellum with red spots around its margin and a yellow centre. 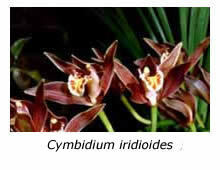 These features help distinguish it from Cymbidium tracyanum, with which it is frequently confused. Its colours are dull and the species has never been popular with hybridists. The species name giganteum referred to the size of the plants, not the flowers. 2. Cymbidium eburneum was also found in the Khasia Hills at an altitude of about 1500 m. It first flowered in Loddiges nursery in 1847. The flowers, white with yellow-banded lips, are 80-120 mm across. Each pseudobulb usually carries two inflorescences (sometimes more) but there are only one or two flowers per inflorescence. This species has been widely used to confer large size and white colour to its hybrids; unfortunately, it also conferred a low flower count to its early progeny. 3. Cymbidium hookerianum (syn. 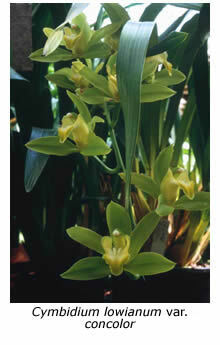 Cymbidium grandiflorum) has large green flowers, up to 125 mm across, on a pendulous inflorescence. Introduced to cultivation in 1851, it confers large size and a clear green colour to its hybrids, especially the early flowering greens. The flowers of both it and its progeny are prone to fall at high temperatures. Some growers find it difficult to flower every year. 4. 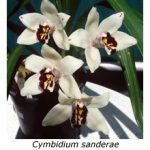 Cymbidium sanderae was found in Vietnam by Wilhelm Micholitz in 1904 and introduced into cultivation by Frederick Sander. It carries 10-15 pristine white flowers per inflorescence during winter. The labellum is marked with heavy red bands and the flowers have heavy substance and are heat tolerant. These features are transferred to its progeny. 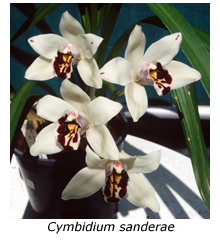 Mrs. Emma Menninger colchicine-converted the diploid form to make the tetraploid generally referred to as Cymbidium sanderae ‘Emma Menninger’. This is the form most commonly used in hybridising and is being used by Andy Easton to produce heat-tolerant hybrids suitable for warm climates. The most noteworthy hybrid produced to date is Cymbidium Anna Szabo ‘Geyserland’. 5. Cymbidium lowianum var. lowianum , first collected in Burma in 1877, is one of the most popular species because it is easy to grow and flower. Also its inflorescences can carry as many as 35 flowers with remarkable keeping qualities, a trait conferred to many of its hybrids. The green flower is 75-100 mm across. Its labellum has a characteristic red V-shaped marking that is conferred to its progeny, even to modern-day hybrids. There are two other important varieties. Cymbidium lowianum var. concolor, which has green sepals and petals and a yellow V-shaped lip marking, has been widely used in breeding pure-colour, large-flowered cymbidium hybrids. The other variety is Cymbidium lowianum var. i’ansonii, which has yellow-orange sepals and petals with an orange V-shaped lip marking. 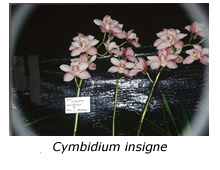 This variety has been useful in breeding standard cymbidiums with orange and red flowers. 6. The first cultivated plant of Cymbidium tracyanum flowered in the nursery of Mr. H.A. Tracy in England in 1890. It was a pleasant surprise for Mr. Tracy, who had purchased the plant as one of a batch of Cymbidium lowianum plants collected in Burma. The flowers are different to those of Cymbidium lowianum in a number of respects. Cymbidium lowianum flowers in late spring and has long-lasting flowers, whereas Cymbidium tracyanum flowers in winter and its flowers are short-lived when cut. At first Cymbidium tracyanum was very expensive but today both species are modestly priced and are common in Melbourne. 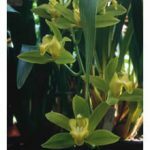 Cymbidium tracyanum is useful in hybridising for conferring early flowering, brown and yellow colours and (occasionally) perfume to its progeny. 7. 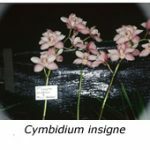 The most important of all cymbidium species used to produce large-flowered hybrids, Cymbidium insigne has variously coloured flowers measuring 75-100 mm across. The lip is patterned with crimson/purple and there are usually 12-25 flowers per inflorescence. Micholitz first collected it for Sander and Sons in Vietnam in 1904. 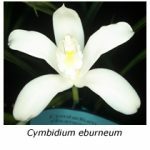 He found it growing at an altitude of 100-1500 m in company with Cymbidium lowianum and Cymbidium eburneum. There is also an album variety that (with Cymbidium lowianum var. 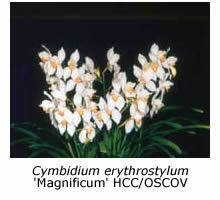 concolor) has been very important in developing pure-colour cymbidiums. Cymbidium insigne has been widely used by hybridists. Without this species cymbidium hybrids would never have reached the stage of development and popularity that they currently enjoy. 8. Cymbidium erythrostylum is another rare orchid collected in Vietnam by Micholitz for Sander and Sons. The white flowers, ten or twelve per inflorescence, have unusual forward-swept petals, down-swept lateral sepals and a small labellum, characteristics that are conferred to many of its hybrids. The shape and size of the petals and lip were a disadvantage to its early hybrids but the early-flowering time, pristine white colour and down-swept lateral sepals are useful characteristics that have proved especially useful in breeding early-flowered white and coloured cymbidiums of high quality. At the next orchid show you attend, marvel at the wide colour range available in standard cymbidiums and give thanks for the eight species that made virtually all of these colorful hybrids possible.